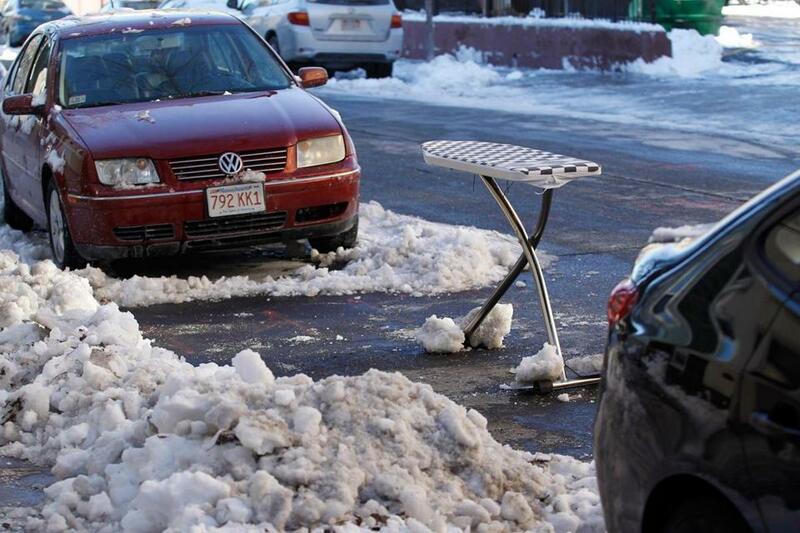 South Boston residents came up with some creative ways to defend their parking spots after Saturday’s snow storm, even though the city had not declared an official snow emergency. The phone rang at the South Boston police station at 5:11 p.m. Sunday. An unknown suspect had just used a nail gun to puncture all four tires on a gleaming, white Jeep Grand Cherokee parked on West Fourth Street. The presumed reason? The sport utility vehicle had lumbered into a parking space, shoveled and claimed with a sawhorse, that had been cleared by the nail-gun-wielding vigilante who disappeared into the night. In a neighborhood notorious for protecting its dug-out parking, this brazen act of vandalism stood out. The city had not declared a snow emergency, and Saturday night’s 4.2 inches at Logan International Airport appeared to be more of a meteorological nuisance than a nightmare. In the absence of such an emergency, space savers are supposedly forbidden in Boston. When an emergency is declared, space savers are allowed for 48 hours. After that, they are technically considered trash to be hauled away. But in South Boston, enforcement is as unpredictable as the weather. Up and down its crowded streets Monday, a potpourri of parking-place holders covered the slippery, frozen landscape. There were orange cones, an overwhelming local favorite, as well as stools, crates, barrels, beach chairs, glass-top tables, air-conditioners, pet carriers, and even a pumpkin. 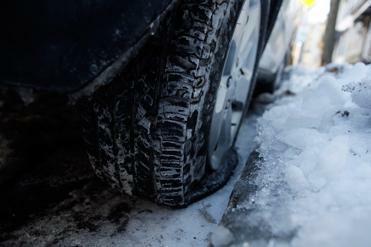 To impress the unimpressed, there was the fate of the stricken Grand Cherokee, its four tires deflated on the icy pavement. Jeremy Dellaria, a 42-year-old who lives nearby, looked at the SUV with widening eyes when told of the vandalism. Dellaria has lived in the neighborhood for a decade, and he said he respects parking rights that are earned by a few hours of hard shoveling. Elsewhere in Boston, a random survey showed occasional space savers in other neighborhoods, but none on South Boston’s front-runner scale. On narrow Maryland Street in the Savin Hill section of Dorchester, shoveled but empty spots far outnumbered ones that had been claimed. On Dunster Road in Jamaica Plain, only a few spaces had been claimed with utilitarian bins and barrels. No ironing boards here. But even in that comfortable enclave near Jamaica Pond, a measure of empathy existed for the cross-city brethren in South Boston. Boston police do not enforce the city’s space-saver advisories, said Officer Neva Coakley, a department spokeswoman. In fact, she said, police are unaware of parking differences between residents unless a complaint is filed. “There are no rules, and it’s not a city ordinance,” said John Guilfoil, a spokesman for Mayor Thomas M. Menino. “There is no law supporting it or banning it. According to police, the owner of the Grand Cherokee had recently moved to South Boston and had no idea what the sawhorse represented. Now, undoubtedly, he does. Up the street, Matty Phelan, a bartender at The Junction, had just handed over $40 for a cab ride from Quincy so he would not have to scour the cone- and barrel-dotted streets for a place to park. In past winters, he recalled, a handicapped man who lived nearby had even put a walker in a nonhandicapped spot.